THE WELSH Armenian community has been left reeling after a monument to commemorate the 1915 genocide was desecrated in the early hours of Holocaust Memorial Day. 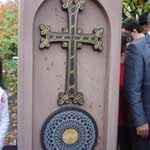 The monument, which is situated at the Temple of Peace in Cardiff, had its ornate Armenian Cross smashed by a hammer which was found at the scene. Eilian Williams of Wales Armenia Solidarity condemned the attack, which happened just hours before a memorial service in remembrance of the 1.5 million Armenians killed in the genocide of 1915. He said: “I call on Armenians and other sympathisers throughout the world to send messages of support to Wales Armenia Solidarity which we can send to the Prime Minister of the National Assembly of Wales.